A distinguishing advantage of taking up a program with us is that you will have an option to get a personal profile page on our website. 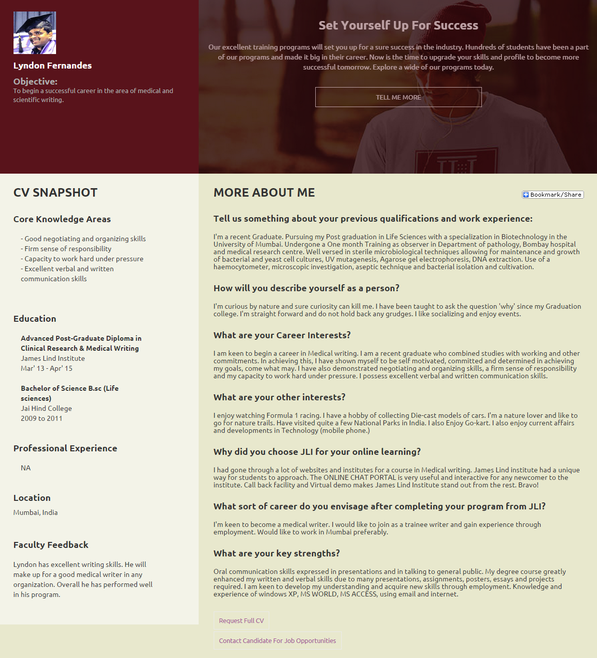 This personal profile page can be updated by you on a regular basis for academic and professional details and is viewable to anyone on the internet especially employers. Upon successfully enrolling for any program at the James Lind Institute you will be able to create and update a profile page for yourself. This page will contain some basic information from your CV and provide more insight about your personality to prospective employers. Employers are able to contact you using this page and also request for a full CV should they be interested in exploring opportunities of employment with you. Upon completion of your program your certificate can also be uploaded into your profile page and you may provide direct web-links to your profile to any prospective employers. If you want you can also share your profile in various social networking sites. Having a personal profile page satisfies needs of professional networking and provides you with a gateway to enter the industry. This networking attitude goes a long way for a brilliant career. Access to the personal page will stay with you even after you have completed your program which makes it truly personal.